Warm and cozy. Deliciously filling. So this meal went down two ways at our dinner table…One way for my bowl, and another for Steve’s bowl. Steve wanted the dip his Parmesan-Garlic Toast in the soup, almost scooping it out. I, on the other hand, preferred eating the soup with a crouton-version of the toast (see photo below.) I just cut my toast into bite size pieces and eat a piece with each scoop of soup. 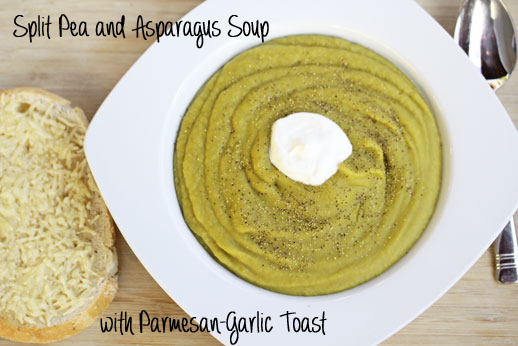 Absolutely loved how the Parmesan and garlic flavors brought out the split pea and asparagus flavors. And with a little bit of sour cream on each bite too…a perfect soup for these chilly weather (even blizzard-y) days! Place the green splits into a colander or sieve and rinse with cold water. Discard any debris. In a large soup pot over medium-high heat, saute the vegetables in olive oil or butter. When they begin to soften and the onions become translucent, add the split peas, ham bone, and 10 cups of water. Stir to combine and bring mixture to a rolling boil. Partially cover the pot and continue to boil for 30 minutes, then remove the lid and simmer uncovered for an additional 30-45 minutes. Look for these in the dried beans and rice aisle! Disclosure: This recipe and post is part of an ongoing partnership with Hurst Beans. Opinions are my own. Love for Parmesan croutons is real. I’ll bet this soup tastes great. However, I do not have fond memories of this soup, so I will not be making this meal. Keep on posting delicious meals, and may 2013 bring you and your family continued success. 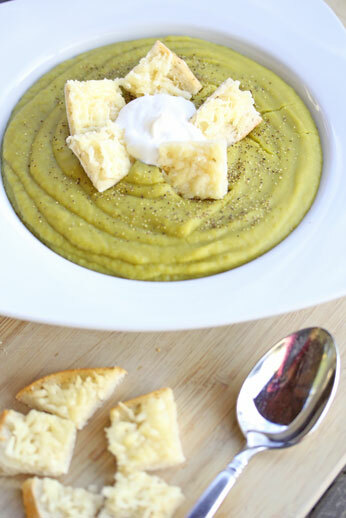 We love split pea soup…and the asparagus, plus the parmesan and garlic flavors make it much more palatable! Just made this with leftover ham (I diced some up and added after blending). I only paid $7.50 for my ham that fed us two nights in a row plus this soup which will be two meals (freezing half)! It is so delicious and I’m not a huge fan of split pea soup but my family loves it. Thanks for the idea of adding asparagus, makes it much more tolerable for me. Thanks! What a fantastic recipe. I love pea soups, especially this time of the year. Thanks for sharing. Quick question! 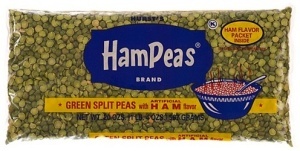 I could not find this brand of split peas:/ can you tell me the size package that is? I found a 16oz bag and I want to make sure that this is the correct size. The bag in the picture says 20 oz (so you need an additional 4 oz to go with your current bag). Hope that helps. I made this soup with just a couple of changes. I didn’t puree it, and I put the parmesan cheese right on the soup instead of having bread with it. DELICIOUS! !